I searched everywhere. I unsuccessfully raided the kitchen cupboards with the hope I’d find the recipe scribbled on an index card splattered in batter. After months of searching, I finally found it in the turquoise journal I filled with recipe notes from when I wrote the book. 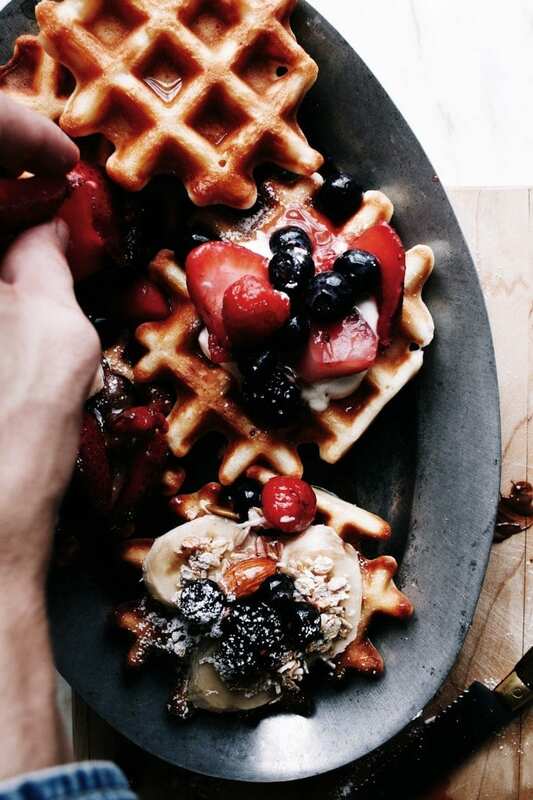 Somewhere between cacao percentages and the perfect crumb-to-apple ratio on a crumble was a nonchalantly scribbled list of ingredients for this gilt-edged Belgian waffles recipe. The Belgian waffles I’m referring to aren’t the classic kind leavened with yeast. Rather, they’re the kind that is a phenomenon in hotel chains and diners all across North America— sweet smelling, deeply welled, golden-kissed, and crisp with a lighter-than-air center. 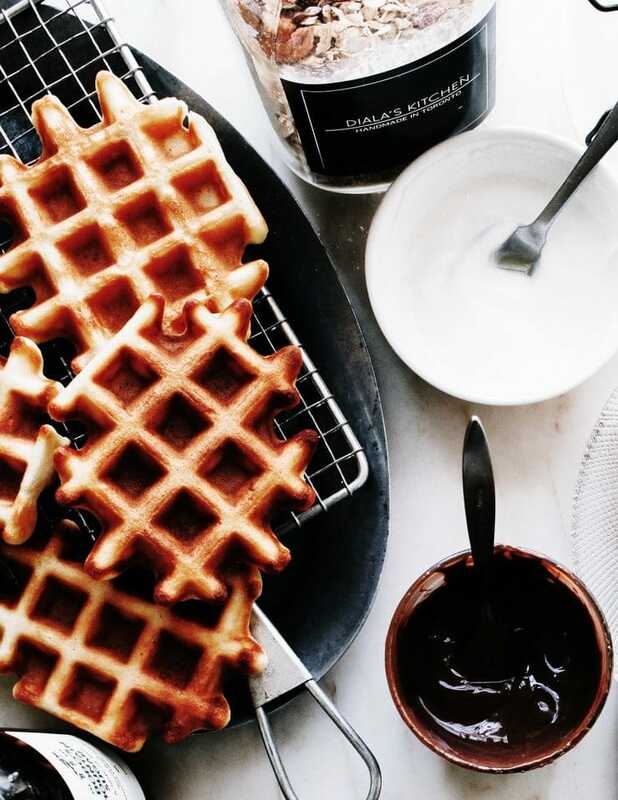 A Sunday morning spent in a sunny kitchen, surrounded by fairytale-like wisps of steam slowly fluttering from the Belgian waffle iron, is oddly reassuring— no matter what time of the year. 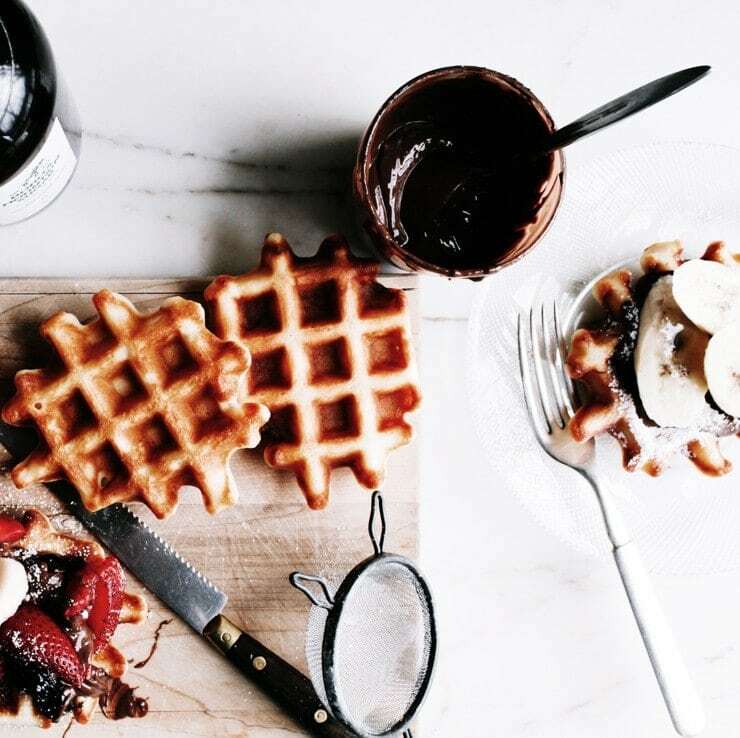 You don’t need earsplitting machinery or a workout to mix up delectable waffles, which is one of the many reasons why you’ll adore this recipe. Everything practically comes together in a few stirs. That’s it. Oh, happy day! 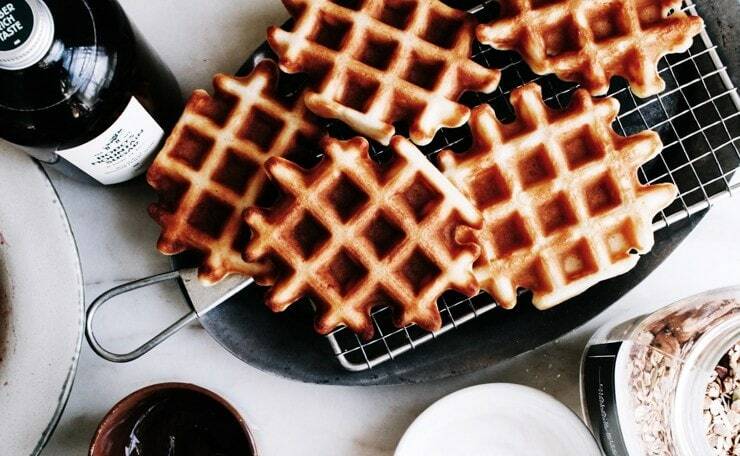 As it is, not every recipe for American-style Belgian waffles is made the same. Some require folding voluptuous clouds of firmly whipped egg whites into the batter. Others also require that egg yolks and sugar be ribboned together until thick and a stunning pale primrose. These methods and tips are acceptable, of course— everyone has a technique that works for them. I’m an impatient cook, I can’t be bothered to transform egg whites into shaving cream foam at 9am on a Sunday. Caffeine and a quick meditation sesh must be had before the cacophonous sounds of roaring kitchen engines. It’s just how I am. Now, please don’t get me wrong, I love mornings— just ones with minimal amounts of noise. The point is… If you’re anything like me and want quick, silent, effortless satisfaction, these are for you. What’s more reassuring is when you sit down to tuck-in and the waffles are still crisp and warm. In my experience, a moderately warm oven can be helpful in maintaining ultimate crispness, but only in small batches. Large batches can end up unappetizingly rock-hard because they can overcook from the heat of the oven. A better approach to all of this is to toss the freshly made waffles— one at a time— back and forth between your hands. This essentially helps release any steam and allows for divine crispness. However, for another approach to this, I’ve some more tips. 1. Use whole milk or buttermilk. Despite the honeyed yogurt and granola on some of the waffles pictured, please don’t be fooled. When it comes to milk, you’ll need to use full-fat (whole) milk in this recipe; this ensures there is less water content in the waffles, which means the waffles will steam less and remain crisp on the outside. More steam means you’ll end up with limp waffles. We don’t do limp and soggy anything around here, pun unintended. For flavor that is found in most classic American-style Belgian waffle recipes, feel free to use buttermilk if you have it on hand. It imparts a lovely tang to the waffles. If you don’t have buttermilk, I wouldn’t bother using the vinegar / lemon juice and milk substitute here. Buttermilk adds a nice tart flavor to the waffles that cannot be recreated with a quick substitute like that. This would work in a pinch, however. Even Bon Appetit agrees. 2. Don’t skimp on the fat. Butter is another thing to keep in mind when it comes to fat. Don’t use it; well, don’t use it as it is for making the waffles. As much as I love butter, it doesn’t create a crisp enough waffle in its truest form. There are options, however. A somewhat obvious option is, of course, any neutral-tasting oil. The other option, which might seem unusual, is clarified butter. If you have the time to make clarified butter feel free to use it here. But, as I’ll probably write many times, please don’t feel obliged to do so— oil works marvelously in this recipe. If you’re worried about imparting flavor, coconut oil is a fantastic option. 3. You don’t need an expensive Iron. Use whatever decent quality Belgian waffle iron you can afford. This is the one I have (I’ve had it for 4 years and it’s still running strong), but I’ve read many good things about this, this, and this. 4. Preheat your waffle iron & use room temperature ingredients. I often let my waffle iron go through a couple cooking cycles while I make the batter. This means the iron will be as hot as necessary, which helps ensure you get crisp Belgian waffles every time. 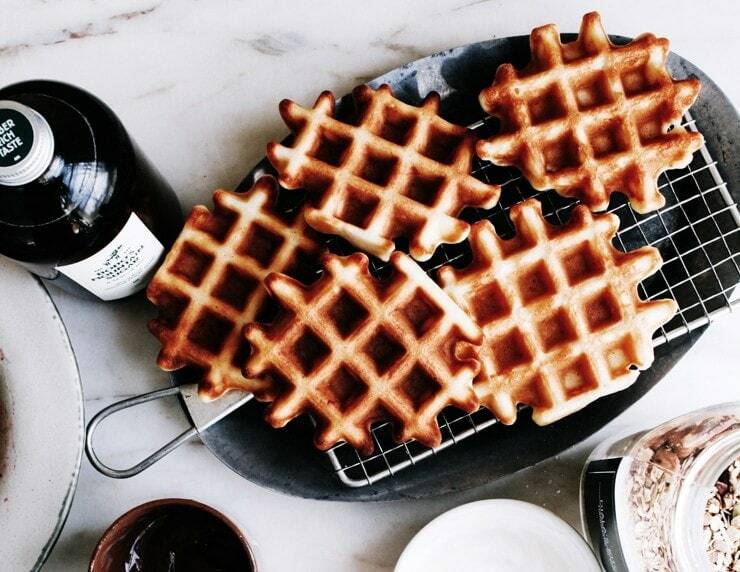 Whilst a cold waffle iron means you’ll end up with soggy waffles, having ingredients that aren’t at room temperature means you’ll likely end up with undercooked waffles. To combat this, you can quickly bring your eggs to room temperature and heat your milk up either in the microwave or on the stove just enough to get the chill off. Despite most waffle irons having nonstick coatings, you’ll need to liberally grease both the top and bottom of the waffle iron with oil. If you’ve ever had the problem of a waffle sticking, it’s likely that you’ve been too stingy with the oil. Worry not; so long as your waffle iron is hot, your waffles will not be greasy. If you’re like me and have forgotten to grease the waffle iron before pouring your batter in, all is not wasted (I promise— you can see how I rectified the problem here). Using a pastry brush, grease around the sides of each waffle, and let the oil settle between the waffle and the waffle iron for about 10 seconds. Then, carefully lift the waffles out of the iron and all should be well in the world! Dear reader, when you mix all of the ingredients together for waffles, you’ll realize that things aren’t as smooth as silk. We’re not going for a cake batter here. The moment there’s no visible flour, you’re ready to go. Easy peasy! 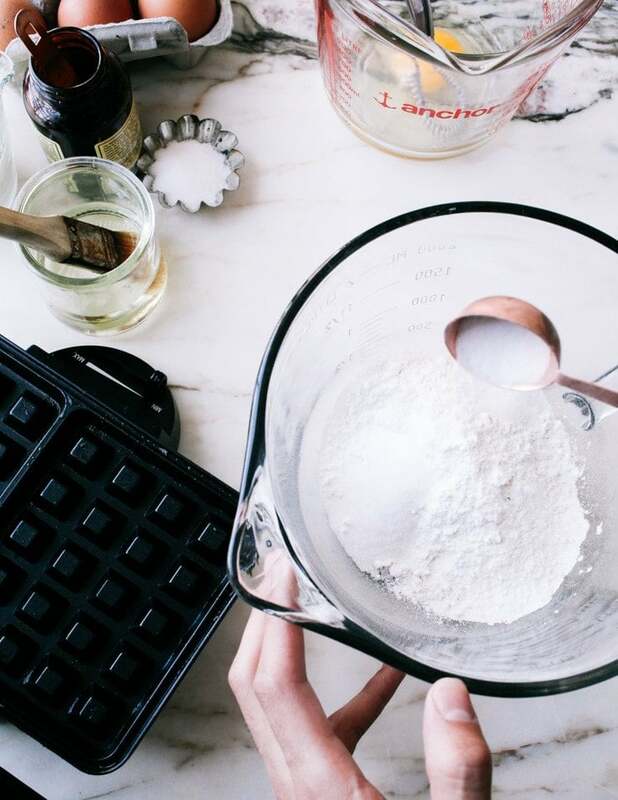 Mixing everything within an inch of its life to ensure a lump-free batter means you’ll likely end up with tough waffles. You’ll know your Belgian waffles are done when you see the steam stop billowing out from the sides of the waffle iron. They’ll also be golden and crispy-edged. One trick to ensuring this is by gently tossing each waffle, as they come out of the iron, between both hands several times. This allows the steam to escape before it hits the plate. 8. Use your oven with caution. To ensure your Belgian waffles are crisp and warm, you can put them in a preheated 350ºF/180ºC oven on the rack once they come out of the waffle iron. This method can be flawed, however. With large batches, the waffles can become overcooked by the heat of the oven. A different method of approach is to preheat the oven to 350ºF / 180ºC and then switch it off once it’s reached that temperature. It’s a tiny bit of futzing around but it ensures your Belgian waffles aren’t overcooked and that they remain warm, crisp, and delicious. A related side-note: I recently made the waffles (live!) on Nom, a new video platform that allows you to live broadcast your cooking adventures. The platform was started by one of the founders of YouTube, so you know it’s good! I’ll be sharing more recipes and having more chats on our channel starting every Sunday, so be sure to subscribe to the channel get notified about scheduling. If you have any recipe or chat requests, please let me know in the comments below! 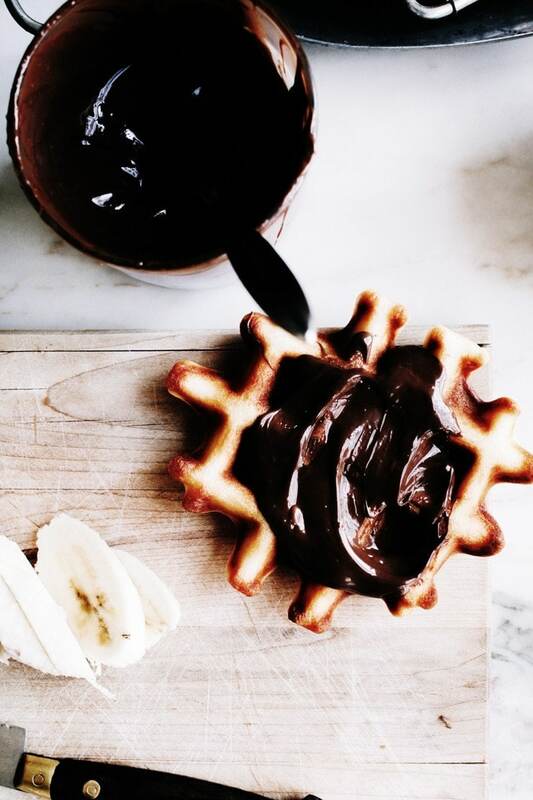 These come together in no time at all and they result in crisp, beautifully bronzed waffles that are the perfect base for any of your favorite waffle toppings. The batter for these, quite literally, comes together in a few stirs. When it comes to the milk, use whole (full-fat) milk— it works best here. If you’ve buttermilk, feel free to use that instead. I’d steer clear of the lemon / vinegar and milk substitute; it’s okay to use this, however. Oil is best for making these; butter just won’t cut it. If you’ve the time to make clarified butter, it works well here. For those of us that haven’t the time to do so for a batch of waffles, feel free to use any neutral-tasting oil. I used sunflower oil, but vegetable, canola, etc. would work well too. For a bit of flavor, coconut oil is a great option. If you’re making a double batch, and want to keep your waffles warm, preheat the oven to 350ºF/ 180ºC and switch it off once it’s preheated. After that, make the waffles as per the directions and put them in the warm oven on a wire rack set on a rimmed baking sheet (avoid stacking them). I’ve also been known to put the cooked waffles straight onto the oven rack in the warm oven– whatever works best for you. Preheat the waffle iron according to the manufacturer’s instructions. In a mixing bowl (I use one with a lip for easy pouring), whisk together the flour, sugar, baking powder, and salt. Set aside. In another mixing bowl, gently whisk together the milk, oil, egg, and vanilla until smooth and combine. Pour the egg mixture into the flour mixture and stir together with a wooden spoon or silicone spatula, until just combined. The mixture will appear thick and lumpy, this is normal; don’t over-mix the batter. Once the waffle iron has preheated, using a pastry brush, coat the inside (top and bottom) of the iron with oil. 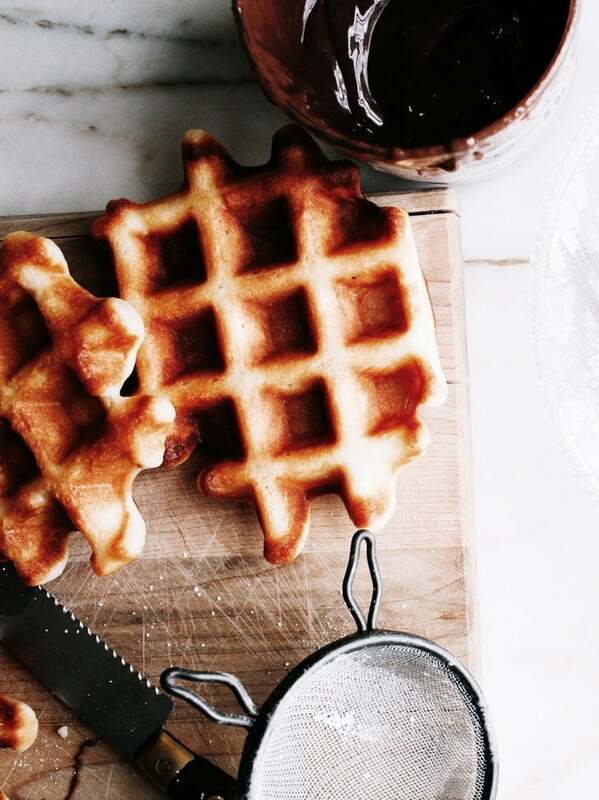 Pour enough batter into the waffle iron to just cover the waffle grid. Close the iron and cook the waffle as per the manufacturer’s instructions, about 3-5 minutes, until golden brown. To prevent the waffles from getting soggy, toss them— one at a time— back and forth between your hands a few times to help release any steam. Continue on with the rest of the batter until done. Serve right away with butter and maple syrup, berries, or any of your favorite toppings. OMG making these tomorrow! Okay silly question- how do I get my waffles to look the same shape as yours. Did you do anything special to them? Hi Rebecca, no tricks here! Just poured them into the center of each section in the waffle iron. Hello! Some waffle recipes using baking powder and baking soda – so which is better, only powder, only soda, or both?? Aiza, that’s a great question! It usually depends on what ingredients are used in those recipes, especially if there are acidic ingredients present or not. I say this because baking soda and baking powder are not the same– they both react differently to certain ingredients. There are a number of reasons for using one over the other, or a combination of the two. Sometimes one is chosen over the other for flavor or even for visual purposes– recipes made with baking soda result in a darker product, while those with baking powder will result in a product that is lighter in color. Using a combination means you kinda get something in between. But that’s done whilst keeping in mind the combination of ingredients used. As there are so many waffle recipes on the internet, I can only speak for mine. It’s about finding a perfect balance of ingredients and and using the right techniques; this recipe is great and just works. Definitely one of my favourite breakfasts! 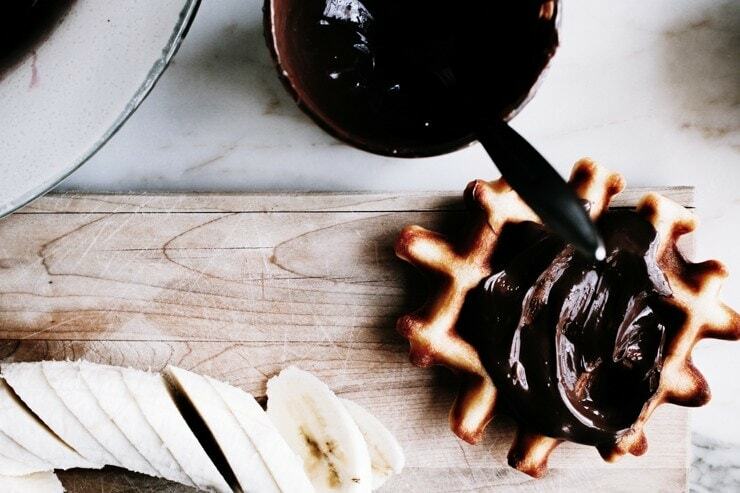 Your waffle recipe looks perfect! I am right there with you about the morning fuss. I mean, I don’t like too much chaos in the kitchen at any point of the day, but definitely not in the morning. And certainly not without a couple cups of coffee in my system. I really need to get myself a waffle iron. I’ve seen way too many waffle recipes that I need to make. Brian, I am so glad I’m not alone in regards to the chaos in the kitchen! 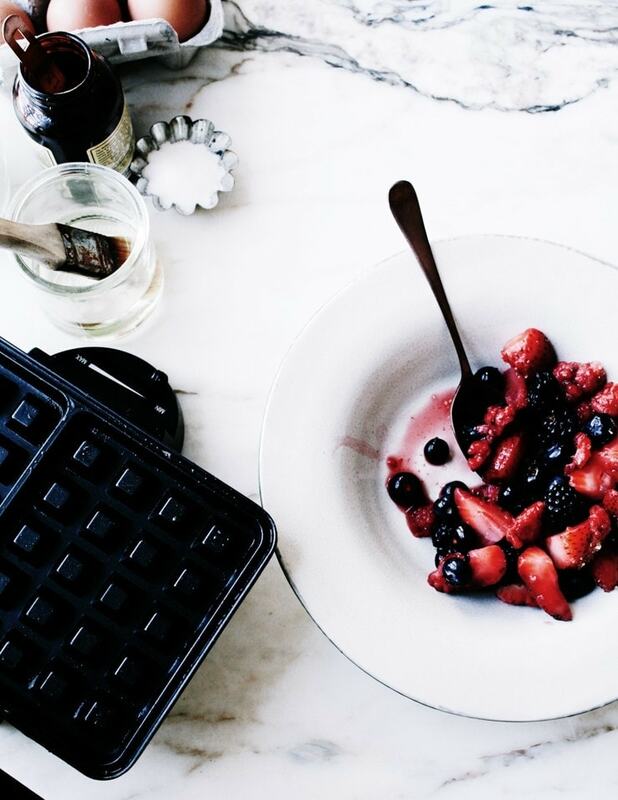 You most definitely need to get on the waffle iron flow. I totally understand why you don’t have one, though! There’s so much food one can consume and often there’s no time to make the same recipes over and over again each week. The waffle iron is definitely a piece of equipment that won’t get a ton of love compared to a stand mixer or a food processor, though I highly recommend getting a good one that’s inexpensive (got mine for $20 when it was on sale on Amazon); you’ll have some good waffle moments with it. Even non-waffle recipes would be fun to try in one! These look incredible! I’m off from work tomorrow so I’ll definitely be making these then. My recommendation for your next nom video… Photography! I’d love to know how you take such fantastic photos. Aw, shucks! I’ll be thrilled to try and work out a video on that. I’ll think up something of how to set it up so that I’m not awkwardly taking photos; maybe Q&A style? 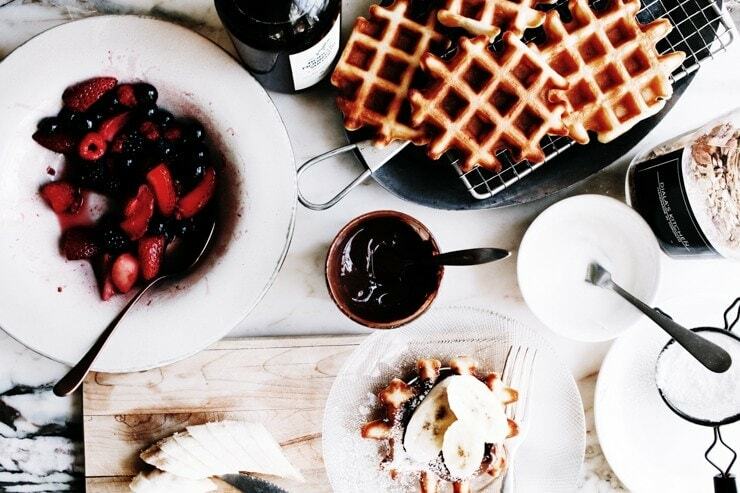 seriously all i am craving is waffles right now, LOVE the photos. Thalia & Keith- many thanks! Do let me know if you make them! Hi Kamran – love the blog post. I got a question though. My partner is gluten intolerant. I tried substituting the flour with GF flour and some xanthan gum but it comes out disappointing. Can you please suggest what should I do to make it GF free? Thanks! Hi Min, Thanks so much! I’m so sorry that things didn’t come out as planned. Unfortunately, it’s not that easy to replace regular flour with any gluten-free flour blend when it comes to certain recipes. I haven’t developed a gluten-free waffle recipe, so I can’t offer any suggestions of how to change this one. 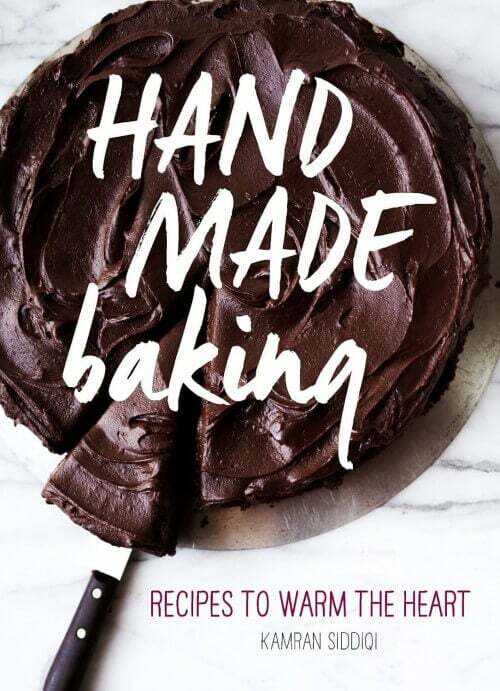 This one shared on Leite’s Culinaria from Shauna Ahern’s book, Gluten-Free Girl and the Chef, is a good place to start. A quick Google search for a gluten-free waffle recipe would also be your best bet. OK… A couple things because my kids are finally asleep and I’ve A TON to say. I’d leave it for email but I’m lazy. I hope you wont mind. 1) I made these for dinner tonight. I loved the tossing tip. We do breakfast for dinner once a week and my kids picked waffles tonight. I used milk. We made a big spread and everyone loved it. I added a little extra vanilla to make the batter a little sweeter without adding more sugar. Thank you for the great brinner. 2) I’m sure you get this all the time, but you’re how old!!!?? 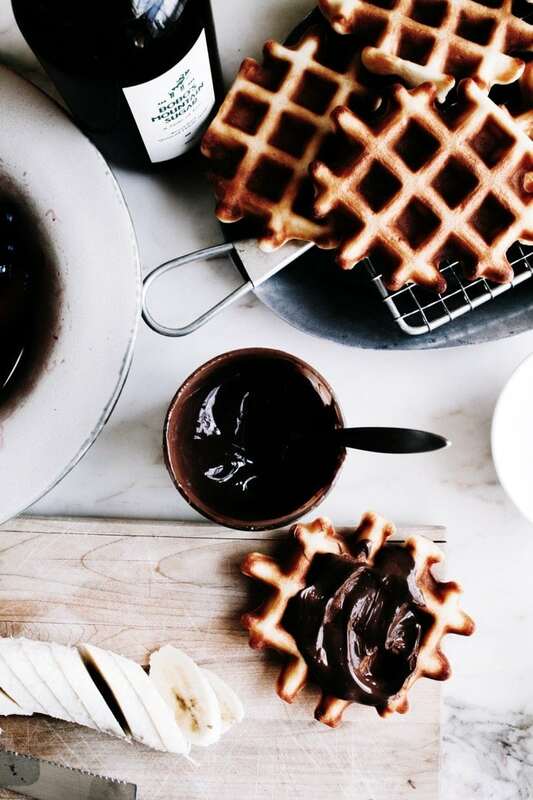 Your writing kiddo… “Somewhere between cacao percentages and the perfect crumb-to-apple ratio on a crumble was a nonchalantly scribbled list of ingredients for this gilt-edged Belgian waffles recipe.” LIKE WHAT! Sorry for the caps, but can you please tell me who taught you how to write so eloquently. I need to know. I’m 37 and can’t write like you! 3) Your live video was great! Can you share some of your favorite cookbooks with us on camera and tell us why you like them? If you only want to share recipes…. how about crepes? Doreen— your comment made my week! Thank you so much for your amazing words of encouragement. Also, I’m so thrilled your family enjoyed these! I love that you added more vanilla; I usually don’t skimp, but these are just a good base to start off with for most things. A little more vanilla, almond extract (or a combo), or anything other flavorings would be fab here. As for the cookbook suggestion and the crepes; great suggestions. I’ll be sure to keep them in mind for the upcoming nom casts! I’m so grateful to have found your recipe! After making a highly rated yet sadly disappointing recipe I found elsewhere, I’m thrilled to read the science behind why certain ingredients do and do not work to recreate that hotel – breakfast style waffle! Usually these are things that I end up looking up on my own and I thank you for sharing those tidbits to save me the work. Your recipe is spot-on and I’ll be following your writing from here on! Thanks for the wonderful waffle recipe. Looks a bit complicated. but I am going to try it out and see how it tastes. Though I can tell from the pictures that its going to taste awesome. Thanks for teaching me this delicious food! I will be making these for my godchildren and they like strawberries and whipped cream. Oh I love freezing waffles so I can enjoy them on weekday mornings. It always seems like such a great treat! Love that avocado/corn combo for topping! so happy to have found your recipe .. it is perfection. used it a few times for some of the most delicious waffles i’ve ever had .. and have now hosted brunch w them. just wanted to say, thanks for posting! FABULOUS! The coconut oil was a great addition. Only word of warning is remember to take the rest of the rest of the waffles out of the oven. [heated to 350, then off. I made a double batch. The 3 of us taste tested the first 2. Made the remainder, putting them in the oven till completed. I didn’t remember there were more waffles left in the oven till doing the dishes. This for sure is replacing the recipe I used for 25 years. Hi Kamran, I’ve always had a thing for waffles. It is my idea of what a perfect Saturday morning breakfast should be – waffles that are crispy on the outside but moist on the inside. I have tried countless recipes in the past and have settled on two go-to recipes, one uses baking powder, the other is yeast based and uses butter. Interestingly enough both of them yield very similar results. I’ve always liked them, but didn’t love them. I have never tried a recipe that uses oil instead of butter until I tried your recipe and I LOVE it! I couldn’t finish using up the batch on the same day so I put the leftover batter in the fridge. I used it up the next day (which is this morning), the result is just as fantastic. Would you mind if I put this on my blog http://lemonchilli.nz, and quote you with a link to your website? Hi Lily- How fabulous; I’m so glad you really enjoyed these waffles. They’re definitely a favorite around here! Yes please, feel free to quote and link away– I’d be honored! I am always skeptical when people leave comments about how great the recipe sounds but not their actually experience with the recipe. I woke up today, Christmas morning, and realized I forgot to buy boxed Belgian waffle mix. I braved a quick internet search before I had my coffee knowing that my son was going to be disappointed if we didn’t have waffles on Christmas morning. I knew I didn’t have any yeast in the house because we eat paleo 95% of the year, so I needed a recipe that didn’t call for yeast. I doubled the recipe because my waffle iron is pretty big and there were 4 adults eating. These were hands down the best waffles I have ever made. I love the tip of flipping them back and forth between your hands before putting them on the oven rack to keep warm. They were crispy on the outside and tender inside. These will definitely be our breakfast treat for many Christmases to come.